It’s ironic and more than a little pathetic that a doctrine as glorious and comforting as Christ’s impending return has been a source of such vehement disagreement among Christians. Though we universally agree that he will return, the timing, circumstances, and sequence of events are all matters of much dispute. Some respond to these disagreements by making eschatology ultimate, the mark of a standing or falling Christian. Some respond by failing to attach any importance to any view of eschatology. There has to be a better way. If you were to ask Dayton Hartman what he believes about the end times, I suppose he’d tell you this: Jesus wins. “By closely reading Scripture and church history, I’ve become convinced that a better way forward is to return to the eschatology of the Apostle’s Creed.” This ancient creed is not interested in a complete eschatology, but a common one: “He will come to judge the living and the dead.” Hartman says, “The eschatology of the creeds does not foster fear or speculation—it calls for hope and anticipation, joy and confidence.” And to me, that sounds like a satisfying and helpful eschatology. 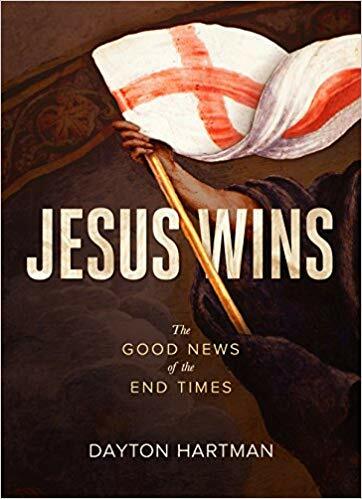 His little book, Jesus Wins, is a short introduction to the end times based on the theme of Jesus’s total victory. He’s convinced that eschatology matters to life and faith and that just because it’s a future-looking doctrine doesn’t mean it’s without importance in the here and now. “What is the purpose of Christian eschatological doctrine or belief? Simply put: Because Christ is present among his people—in an already-not-yet kind of way—we must live like it.” A right view of eschatology helps us live now as as we once did and will again. “All Christian eschatology is building toward a resolution inaugurated by Christ’s life, death, resurrection, and ascension.” We begin to live in the kingdoms of this world in a way consistent with the ethics of the kingdom to come. He then turns to the historic Christian creeds to show that all the common models of eschatology can fit within their declarations of belief. “Regardless of where we land on the spectrum of eschatological interpretations, we agree on far more than we disagree.” And then all that’s left to do is wrap up with warnings and encouragements like this one: “When we make secondary matters as important as primary matters, we diminish the importance of primary matters rather than elevating the importance of secondary issues.” I trust we can all agree that while Christ’s return is a matter of first importance, the exact details are far less crucial. What’s clear and most essential is this: Jesus wins. Hartman’s book is an excellent little introduction to eschatology and one that will be at home in any library. Jesus Wins succeeds both in describing the precious doctrines of the end times and in putting them in their proper place.